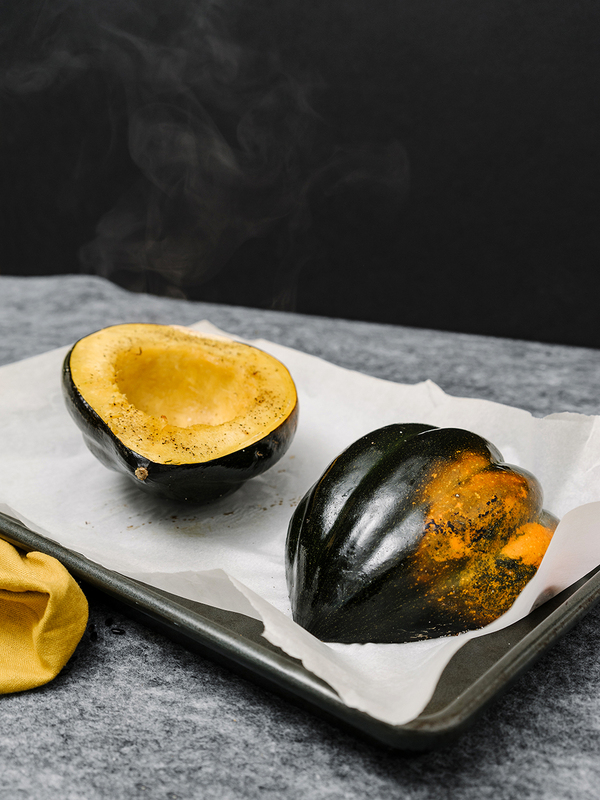 As a Floridian, I didn’t grow up eating fall and winter squashes, so I wasn’t even sure how to cook them, but my interest was peaked when I lived in Virginia and began seeing them at the farmer’s markets. After a lot of research and a few trial and error meals, I fell in love with their unique flavor and versatility in the kitchen. They are now a staple in our house! 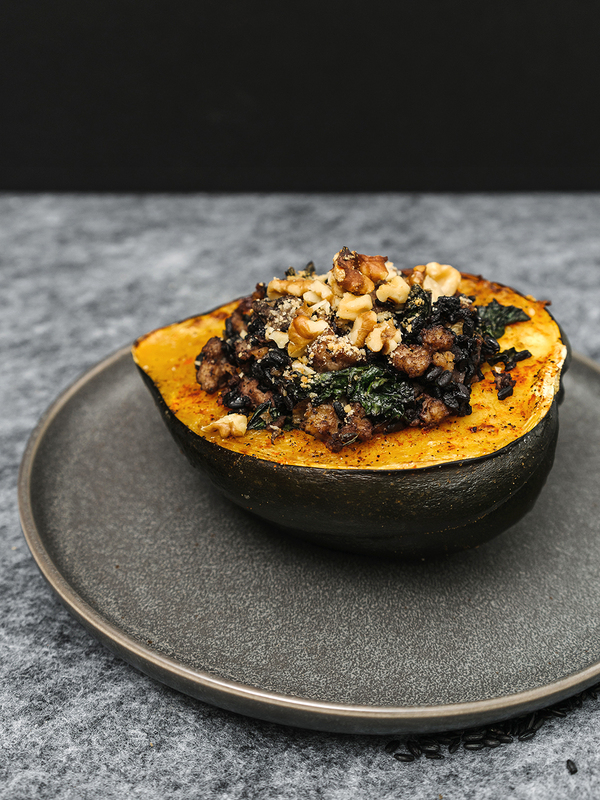 The acorn squash is one of my favorites, it’s sweet flavor makes it so easy to eat–simply roasted and buttered, it’s full of delicious flavor. 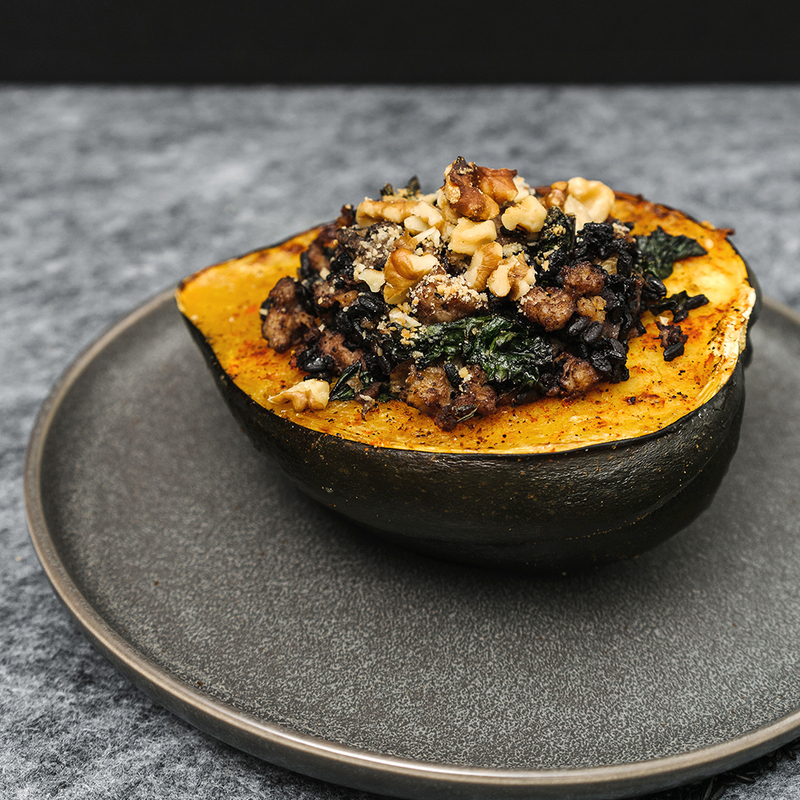 I love pairing this sweet squash with something a little more earthy and robust in flavor which is why this recipe was born. 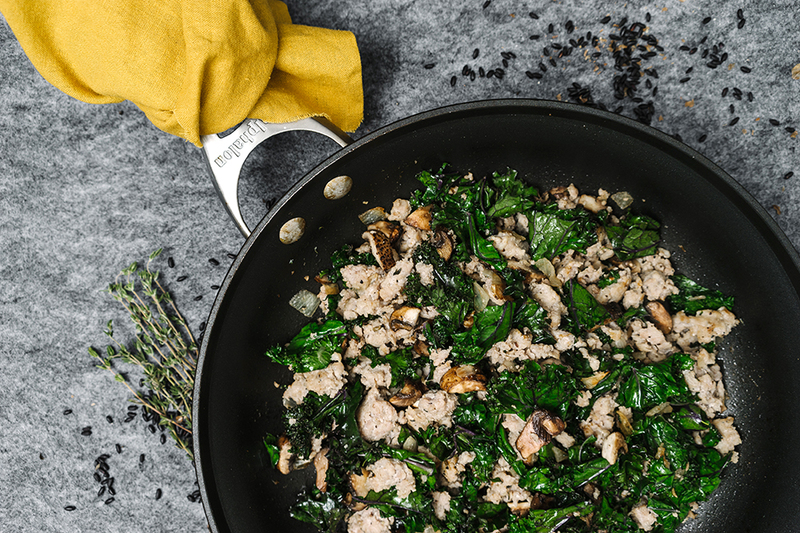 I use a sweet Italian sausage, kale, mushrooms, and walnuts. For texture I add black rice to the mix. 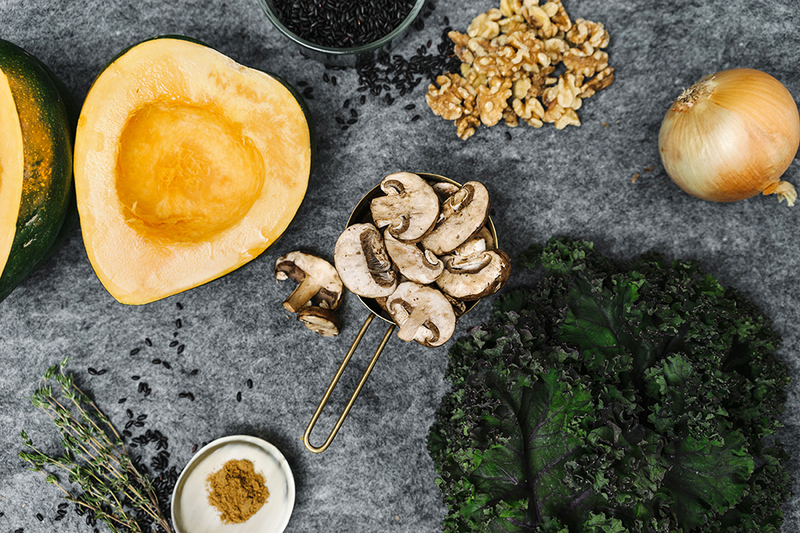 Though of course, you can substitute for another type of rice, black rice is not only unique in its color, it contains the highest amount of antioxidants, protein, and dietary fiber of all rice varieties, plus black rice is also a good source of iron. It’s deep black or purple color is the indicator of its high antioxidant properties, similarly to how deeply colored antioxidant berries like blueberries, raspberries, and cranberries appear. It’s a grain that adds hardiness but also add significant nutritional value. This dish is chock full of nutrients and flavor. I think it hits all the flavor notes of a warm, comforting meal, perfect for those crisp wintery days. 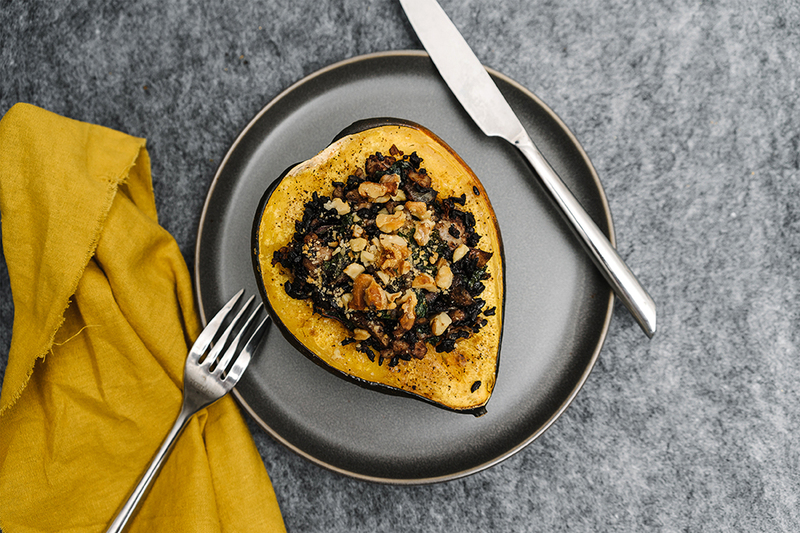 The acorn squash is one of my favorites, it’s sweet flavor makes it so easy to eat–simply roasted and buttered, it’s full of delicious flavor. Bring black rice and vegetable stock to boil in a saucepan. After 2 minutes, cover and set to simmer for 45 minutes. Set oven to 400 degree. Place parchment paper on a small cookie sheet. 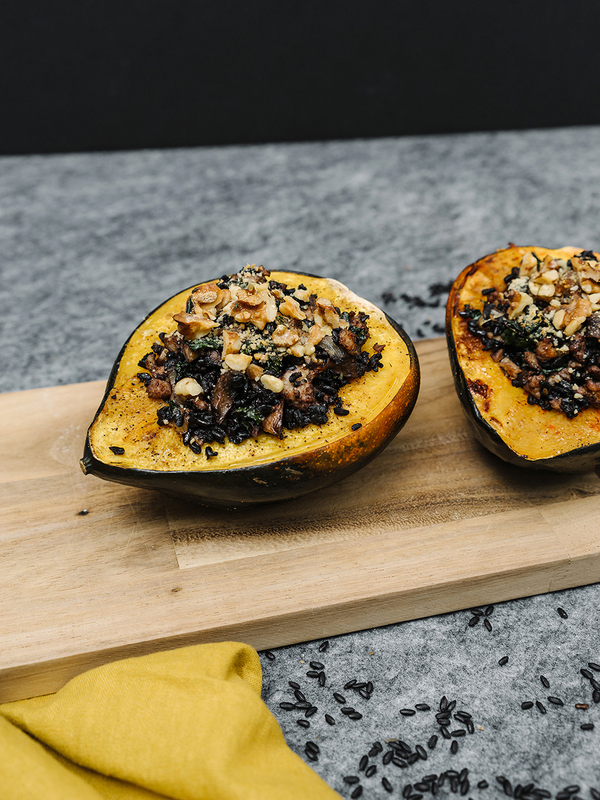 Cut acorn squash in half, scoop out seeds. Rub with oil, salt, pepper and place face down on the cookie sheet. Roast for 30-40 minutes. While squash bakes and rice cooks, add oil to a large saute pan at medium heat. Add onions to the pan and cook until clear. Add ground sausage to the onions, cooking until no longer pink, 7-10 minutes. Add mushrooms and cook for 2-3 minutes, stirring frequently. Add kale, garlic, cumin, thyme and paprika. Stir until kale is wilted. 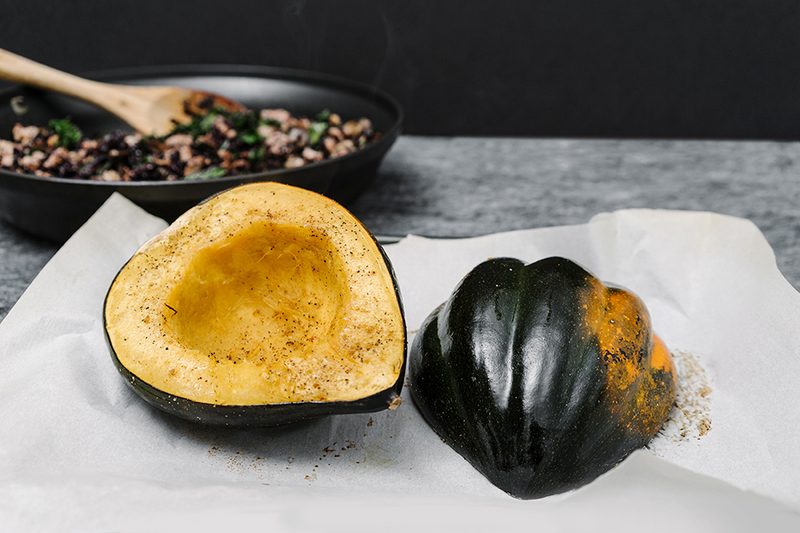 When squash is fully cooked, scoop mixture into the center of the squash. Top with chopped walnuts and cheese, and place back in the oven for 15-20 minutes. Another rice or quinoa can be substituted for this dish.